Okay....there is a discussion on the NSS page about helmets and I had to rant...I couldn't help myself. So here is my rant, and maybe ya'll know some Euro-manufacturers of helmets we dont know about here? Who maybe have nicer helmets? I have the bright blue Edelrid Ultralight. I had great trouble finding a helmet that doesn't slide around. Petzl Elia worked but the bar in the back of the helmet doesn't stay down so it falls side to side. The Edelrid doesn't give me that issue, but now I have an extra light on the front so it falls forward over my eyes when I look down. GRAHHHHHH. I like the extra light but I'd like to see....At least it's more comfortable than the Elia. I'm thinking today I'm going to try super-gluing that dam bar in place on it, because if it were to actually stay in place it might be a lot better (it's supposed to, but the plastic on that helmet is so cheep and crappy it moves around with the slightest jaring, and there is nothing to hold the back piece down at all, it free-moves). My head is a weird shape or something. The Ecrin Roc is the wrong shape, as I tighten it to hold to my head it hurts my temples and gives me a headache in minutes from the pressure, or falls off. No in-between. This is a very standard issue with helmets I try on. Children's helmets are better shaped, but are just slightly too small. I do wear a bandana now with my helmet, which helps it stay in place and gets a bit more circumfrance to help it stay in place. Typical adult helmets are just the wrong shape and bulkey, because my head circumfrance it should fit any adult helmet, but I have to adjust them down SOOO far to just try and stay in place as it is on the extreme low end, but the children's helmets have very little overlap so they are just a touch small. It must be a shape-thing, and I wish there was an in-between size! And yes, everyone says "it's just not adjusted right!" ...I have had many cavers swarming my head readjusting my helmet every which-way for me who say this and feel they are experts in helmet adjustment. It just dooeeesnnnt work! So...I have the Elia which falls side to side but maybe I can fix that with glue...and the Edelrid which is fine until I put lights on it. Best I've gotten so far! Certainly with motorcycle helmets you've got Shoei shaped heads and Arai shaped heads, so I see no reason why it shouldn't be the same with caving lids. Only suggestion I can make is to wear a soft cap underneath to take up some of the slack/pressure points. The list of lids you quote is pretty much the same that's available over here. You could put those buggers on sideways....painting them never worked, did it? Hasn't the Ecrin Roc got some different sized inserts - assuming you can even get them now, could you not put different sizes in to pad out certain parts of the helmet? As for the light situation, I used to have a helmet based light with battery at the back and the battery/compartment was heavier than the light and the helmet tilted as a result. I now own a light (still with battery stuck at the back) that is very nicely balanced so don't seem to have that problem any more. Just a thought that it might help to not overload the helmet and make it too front or back heavy.. If you don't mind a broken skull in the event of actually needing the lid as protection rather than a handy place to mount a lamp. The space is there for a purpose. all five inches? LOL ok maybe a bit of an exageration. Three inches. Not on top, in the back where the battery pack goes? Anyway, I was mostly kidding. I've just heard of people doing that. Well I just superglued my Elia. It still rocks side to side but not as badly. perhaps I'm just not used to the suspension of the Edelrid yet. Looking at how people's ecrin rocs fit, a lot of them come belwo the eyebrows too. Maybe I just have to get used to not seeing upwards well because of how low it gets with lights on the front? It comes all the way down to the edge of the bone where the eye sockets are for me with lights on it. It is true they got soft when wet but could be dried in a tumble drier (the dents disappeared). You could try padding the crown band out with thin strips of foam (Karrimat type) glued, stick velcro-ed or zip tied on (with the flat part of the ziptie against the head, duh). I've done this with one or two of my centre helmets for very small heads. Edelrid used to do a small size version of the ultralight - tried that? My Elios also slips sideways (have binned the edelrid in my avatar - couldn't get a peculiar pong out of it) but this is due to the backup light making it unbalanced. I just live with it. I've also since grown a massive afro which helps with the padding! I did try the junior version of the Ultralight. I didn't have my bandana on me at the time of trying it on (i wear a bandana caving to keep my hair out of my face and give extra squishyness for the helmet to grip to) and i had to have it all the way open to get it onto my head. With a bandana, I was worried it'd not fit! My bf had the idea of a different helmet mount for my second light I mentioned, and that actually really helps but it's not quite perfect. Although in talking to others, crawling and such where your head isn't straight, or stoopwalking and looking down at feet for a while, their helmets slip around too. Although I had great chance to check this with the new mount and a fresh adjustment attempt on Saturday... 800 ft of either stoopwalking, crawling, or belly-crawling (on cobblestone in the water to boot!) and it stayed a lot better in place with just getting the light mounted close to the helmet rather than sticking out in front and tightening it down over a thicker bandana. But of course with that distance of crawl I notice the heavyness....guess I need a stronger neck, it was screaming by the end! Burt I love the padding idea, I may have to try that. Even just a thin bit, as the thick-bandana seemed to help. LOL maybe I should add velcro...it can stick in place! ha-ha-ha. Underground - I asked my bf about the light (he got it for me to try since I like his zebra H600, but we didn't know how much I'd like it in practice so saved some money =D) he said to "Google ultrafire UF-H6, for <$40. But zebralight H600 is better choice if they can afford it" H600 def. better build...in one trip I already had to replace the O-ring on the UF-H6. >_< Not sure how much I'd trust the UF-H6 if you're gonna be getting it soaked. I know I'm digging up a really old topic here, but I've just modified a Petzl Elia to achieve the same thing and it's worked really well. Basically the Elia has a plastic band that runs around the back of your head which can be both tilted up and down on a ratchet-like mount and independently tightened. This would be great if the ratchet-style mount would stay in place, but it doesn't when the helmet is used in anger. 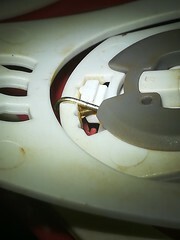 To fix this I have melted holes in the bracket using a paper-clip heated over a candle flame. 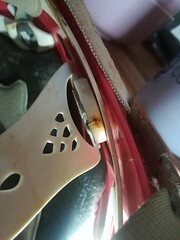 Once melted the paper clip can be pushed through the holes and the ends bent over to hold it in place. This has massively improved the wearing experience and is easy enough to undo if needs be. 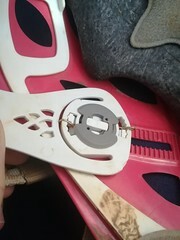 Because the plastic band can be loosened it is still easy to put the helmet on, so the fix can be pretty much permanent. I can post photos if anyone is interested. I've got a black rock helmet made for women. I forget the model of it but it has a high back so ladies can wear their hair in a pony tail. It is quite comfortable and wobbles less than other helmets I have tried but does slide down a bit when I'm crawling. If you tighten it up enough on the straps and round the circumference of your head it should stay in place. Helmets never fit my head, either there too tight and I get a headache, or I wear them at an angle exposing my forehead, my head is longer than most. I do have an odd-shaped head, no adjustment sorts it, I can get it to fit sometimes but it really does hurt and I get a banging headache after an hour. Bo helmet really fits me properly. That's why in most of my photos the helmet looks like a topee, as that's the only way I can wear them without pain. i have never got on with Petzl helmets, apart from the relatively new Boreo, but I haven't used it for caving yet. I've found that Black Diamond helmets fit me very well and they do a hard shell called the Half dome, which is similar to the Petzl Elios range. I have had very similar issues with helmets! I used to have a wild country 360 and had a similar problem with getting it to fit and sit straight as I have a very small, apparently unsymmetrical head. After trying on many different helmets I now have a climbing technology stark helmet and similar to JoW (although a different version) I find it much more comfortable and have had very little issues with it. The wheel which resizes it did get jammed once but it's just had some cave grit wedged in it which was easily cleaned. Has anyone considered a snowboarding helmet? I got one to use instead of a cycle helmet. Hard shell with rigid foam padding. Quite comfortable too. Well these images should explain the modification well enough! Note that you can't just glue or pin the adjustment notch in place as it needs to be free to jump up and down as the back band is tightened. I also tried using polymorph (a plastic that becomes malleable when immersed in boiling water) to try and create a wedge that could hold the adjustment notch in place and prevent it from jumping into different slots, but I couldn't come up with a nice way to stop the wedge falling out all the time as the back band was tightened. Indiana Jones favored a high-crowned, wide-brimmed sable fedora through many of his adventures. This is shown in the various documentaries of his adventures.